Srinagar Sep 15 (IANS) Three militants were killed in a gunfight in Jammu and Kashmir s Kulgam district on Saturday police said. 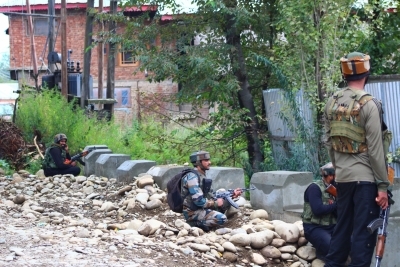 Upon receiving a tip-off about the presence of militants the security forces on Friday night cordoned off Chowgam village of Qazigund area and launched a search operation. "Immediately after the militants were trapped inside a house they started firing at the security forces triggering the gunfight " police sources said. "Firing exchanges have now ended but searches are going on. The bodies of the three slain militants are yet to be recovered." Reports from the area said the house in which the militants were hiding was razed to ground during the gunfight. Meanwhile train services between Srinagar and the Bannihal town that passes through Qazigund area have been suspended. Mobile internet services have also been suspended in Kulgam.